What defines our Log Homes? The extra care to craftsman details. The passion for quality workmanship. The desire to serve customers beyond their expectations. Our primary log yard is located in Clearwater, Idaho as well as a second log yard in Stevensville, Montana. How do we define a hand crafted log home? It’s all in the extra care to complete the full details of a log structure, including our passion for quality workmanship, and the desire to provide high quality customer service to complete a modern log home that meets our clients needs. The log homes we build are first constructed in our log yard and then numbered, disassembled and trucked to your home site for reassembly. Our crew is available for assistance or full assembly of your home, depending on your location. 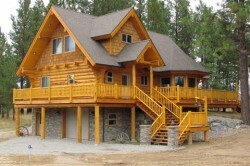 Clearwater Log Structures is pleased to provide a quote on your quality, hand crafted dream log home. Please feel free to contact JR Troyer by phone or email anytime with questions and planning. Thank you and may God bless your day. JR Troyer was raised on a farm in Ohio Amish community At an adventurous age of 22, JR was getting restless. His brother Willie had meanwhile moved to Montana in 1990 and talked of opportunity. After deciding to move to Rexford, Montana in October of 1992, JR started working for Kootenai Log Homes. It did not take JR very long to determine in his mind this was challenging, especially with building a log home with a chainsaw. The work was rewarding to make each rustic log fit tight and snug in the corners. In 1993, the company made some ownership changes with the employees. JR and five other partners purchased Kootenai Log Homes. 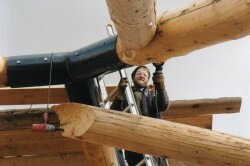 As JR gained experience building log homes, a lot of changes were made. In 2000, JR sold his shares and moved to St. Ignatius. While building cedar gazebos for six years in St. Ignatius. JR’s log building passion never left him. JR rented a lot on Hwy 93 and formed Mission Creek Log Homes. 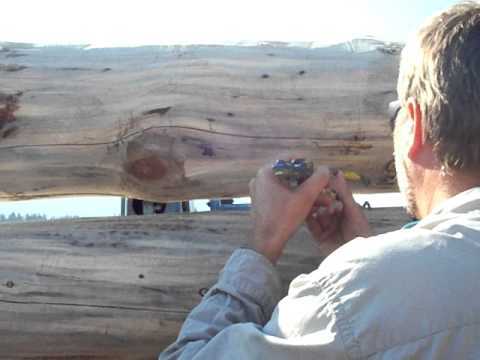 Since then, JR and his crew have been building log homes all over the northwestern parts of the country. JR lived in St. Ignatius, MT with his wife Nancy, where their 7 children were born from 2000-2008: Jeremy, Jolena, Julia, Josiah, Janette, Juanita and Jalisa. In 2012 a group of 6 families moved to Grangeville Idaho to spread out in church work. JR & Nancy bought 40 acres in a small rural community called Clearwater, Idaho. JR had a desire to labor and relate with his family in a more rural setting. Since then JR is building log homes with his family in their log yard on the farm.